The mythical ‘Yeti’ or abominable Snowman has been spotted casually roaming on the streets of Boston. Social media has gone crazy with the “sightings,” prompting an avalanche of #BostonYeti2015 tagged posts. Usually sightings of the abominable snowman, also referred to as the Yeti, have always been quite obscured, hazy and many times, downright incomprehensible. However, this Yeti openly roamed the streets of Boston. The blizzard that has been lashing major parts of America for the past few days ensured multiple “Snow Days,” causing many schools and institutions to remain shut. 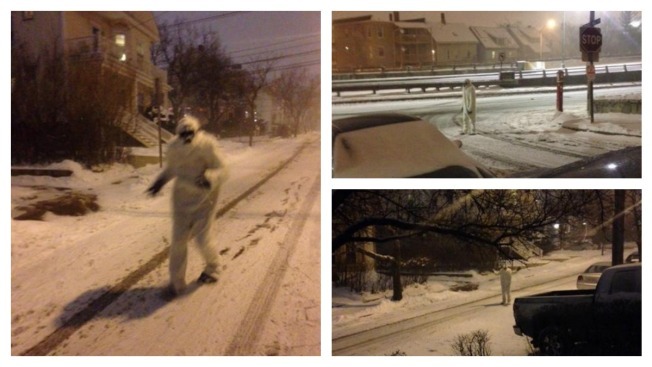 However, instead of staying indoors, a man wearing a Yeti suit has been nonchalantly roaming the streets of Boston. Curious, bemused or scared individuals flooded social media sites with the hashtag #BostonYeti2015. The person wearing a costume of the mythical creature has been seeing roaming the desolate streets of Somerville, Massachusetts, leaving a trail of footprints in the snow. The Yeti is an original resident of the Himalayas. They are known to be a relatively peaceful breed that inhabits the inhospitable regions of the cold, frigid regions where humans seldom tread. These creatures are said to sport thick, white fur that allows them to blend in their surroundings. However, for the 2015 blizzard, the creature found itself in the Boston suburbs, prowling the streets. The Yeti clearly seems at ease in the raging snowfall and bone-chilling winds that are currently howling in the streets of Boston. Spotting such mythical and mystical creatures has sort of become the norm. Another such creature with a brown coat of fur was recently spotted in Washington D.C.
Interestingly, the Boston Yeti, who has been finding it near impossible to hail a taxi, could have read up about the travel ban that is currently in effect due to the blizzard. The identity of the person inside the yeti suit continues to remain a mystery, but the Twitter handle just showed up on Monday, so it appears the Boston Yeti chose to visit the regions to enjoy his hometown weather.